Longman, Tremper, III and John H. Walton. 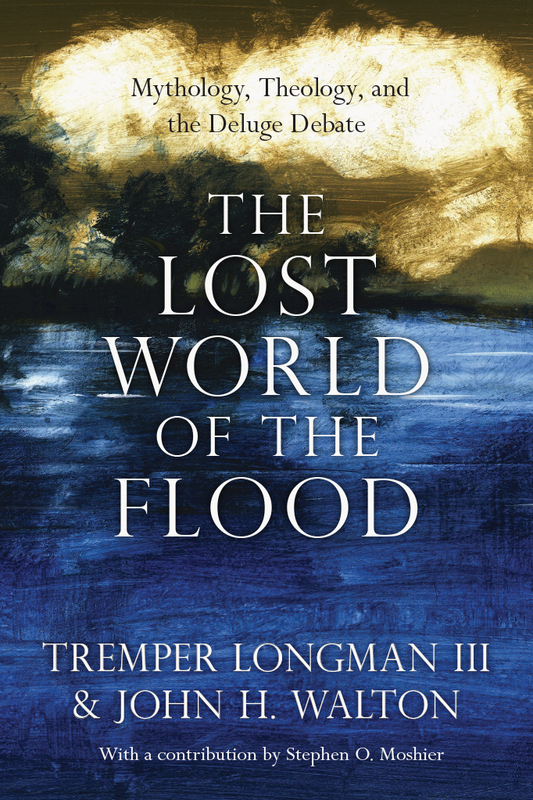 The Lost World of the Flood: Mythology, Theology, and the Deluge Debate. Downers Grove, Ill.: IVP Academic, 2018, pp. 192, $18.00, paperback. Tremper Longman and John Walton have served as professors of Old Testament and separately published books on Old Testament topics as well as commentaries on several biblical books. 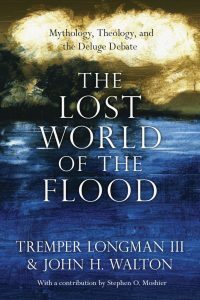 The Lost World of the Flood is the second book they have published together, having co-authored How to Read Job in 2015 (IVP Academic). This book is the fifth of IVP Academic’s “The Lost World” series, all of which are either authored or co-authored by Walton. The chapters of this work are a series of seventeen propositions, a format which has been consistent throughout the Lost World series. The main benefit of the chapter titles being full-sentence proposition statements is that the reader can gain an understanding of the whole book simply by reading the table of contents. The risk involved in such an approach is that some readers may react to a proposition that they find to be provocative by dismissing the book without letting the authors explain their position. The propositions step through a logical progression, and each chapter builds on the ground gained by the preceding chapters. First, Longman and Walton introduce to the reader that Genesis is an ancient document which should be understood the way the ancient readers would have understood it. Then they assure the reader that the events portrayed in the biblical text are based on actual events from time-space history. But they contend that communicating empirical facts is not the primary goal of the biblical author. Rather the goal of the biblical author was to make a theological point, and therefore the information contained in the text of Scripture may not be the kind of information that can be used to reconstruct what actually happened in time-space history. For those who deny the flood was worldwide, the most common approach is to try to explain that the text does not actually say the flood was worldwide. Supports of a local flood will often translate the Hebrew word for Earth to mean ‘land’ in an attempt to make the story fit with a localized flood. Longman and Walton deny that the text of Genesis 6–9 supports such a possibility. They correctly assess that the story in the Bible is the story of a worldwide flood, and that one cannot force the text to say that the flood was local. Thus, tension exists in the fact that the text says the flood was worldwide and there is a lack of geological evidence for a worldwide flood. Longman and Walton’s plan is to explain that the text does not mean what it says. Rather the text used the story of a worldwide flood to communicate a theological truth. They list numerous impossibilities in the flood story, which Walton has previously discussed in his Genesis commentary in the NIV Application Commentary series. No wooden boat of the size described in the text has ever been built, much less in ancient times. Noah and his family could not possibly have built such a boat. The waters could not possibly have risen at the rate required for the timeline given in the text, etc. The catalog of impossibilities leads them to believe that the biblical author and the original audience would not have believed that the words mean what they say. They would add to the list the proposed impossibility that the flood was worldwide. According to Longman and Walton, the biblical author intended the flood story in Genesis 6–9 to be understood as hyperbole, and the ancient readers would have recognized the story as hyperbole. In other words, the biblical author and the original audience never believed that the flood was worldwide, and therefore the modern reader should not. The biblical author chose to represent the event as worldwide in order to make a theological point. A refrain of the book is that the interpretation of the events is the inspired Word of God, not the events themselves. But the student of the Bible should note that God sovereignly presides over the events of history, and one could argue that God has in fact inspired the events themselves as well as the recording of those events by biblical authors. Foundational to their claim that the flood story was hyperbole is the establishment of other biblical texts as analogies of hyperbole. In this way they are consistent in their disbelief that the Bible means what it says. But the student of the Bible should be careful to consider whether their analogy texts are definitely hyperbolic. One analogy text they include is Joshua 1–12 (comprehensive conquering of the land) contrasted with Joshua 13, which begins to reveal how much of the land was yet unconquered. They argue that the earlier statements were hyperbole aimed at a theological point while the latter statements were the honest picture of the historical situation. But hyperbole is not the only way to understand Joshua’s presentation of the conquest. It could also be the case, which is common in Hebrew narrative, that the earlier chapters were an overview of the story, while the latter information explained more detail. Hebrew narrative follows this circular form of storytelling in several places. In order to establish that hyperbole also exists in the immediate context of the flood story, Longman and Walton point to Genesis 6:5 as a verse which would be understood as hyperbole by all except for the most literally-minded reader. But to claim, as Longman and Walton do, that the thoughts and intentions of man’s heart could not possibly have been only evil in every action represents a fundamental misunderstanding of the depths of depravity brought on by man’s sinfulness. Isaiah 64:6 provides helpful detail concerning the filthiness even of man’s righteous acts apart from the redemptive work of God. Additionally, if Genesis 6:5 is an exaggeration of the sinfulness of man meaning only that sin had reached unprecedented levels and that a worldwide flood would be deserved in such a situation, then why would God restate the same fact about the total sinfulness man’s heart after the flood (Genesis 9:21)? If the point of the text is to make a theological rather than historical claim, then why would one even claim that there is a historical event as its referent? What keeps a person from arguing that the theological meaning is the only meaning, and that it doesn’t matter if there is any historical veracity to the story? Could the biblical stories not be understood as parables? Contrary to Longman and Walton, it does matter that biblical events actually happened in time-space history the way they are recorded in the text. To definitively disprove that a biblical event happened as recorded in the text would strike a severe blow against any theological point made by the text. If the reader cannot believe the words on the pages of Scripture, then why would the reader believe the theological point being made by the same Scripture? Longman and Walton have found a way to disbelieve the text of the Bible while claiming to uphold the inerrancy, infallibility, and inspiration of the same text.